A series of tests performed on the latest version of Apple's iPad 2 show that the move to a 32nm-process A5 chip results in battery life improvements of as much as 15.8 percent. Alongside the launch of the third-generation iPad, Apple announced in March that it would continue to sell the Wi-Fi and 3G versions of its 16GB iPad 2 for $399. It was later revealed that some new discounted iPad 2 models made use of special A5 chips manufactured using Samsung's 32nm chip-making process. Samsung previously used a 45nm process for the A5 chip. Early on Friday, Anandtech published the results of its tests with the iPad, known as the iPad 2,4. The site reported having difficulty finding the newest version of the iPad 2, as there was no way to tell whether the device contained the 32nm or the 45nm chip without opening the box. "This particular iPad 2,4 sample came from Best Buy, and several attempts to find one elsewhere came up short. All indications seem to point to the iPad 2,4 being relatively rare, which makes sense considering what's inside it," the report read. In addition to the smaller 32nm process, the new A5 also reportedly uses high-k + metal gate LP transistors. The smaller die and new transistors combine to make the chip more power efficient. Apple is believed to have used the new Apple TV and $399 iPad 2 as an opportunity to test the smaller chips before adopting the process for higher-volume devices. The device lasted for 11.7 hours during a web browsing test, compared to 10.1 hours from earlier versions of the iPad 2. By comparison, the third-generation iPad lasted between 8.48 and 9.28 hours, depending on whether it was a Wi-Fi or LTE version. 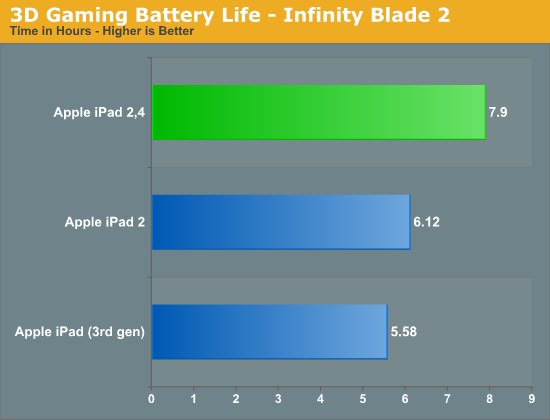 A 3D gaming test using the "Infinity Blade 2" application showed the iPad 2,4 as lasting 7.9 hours, compared to 6.12 hours on the iPad 2 and 5.58 hours on the third-gen iPad. A less graphics-intensive app also showed similar results. Anandtech also conducted a video playback test that got 15.7 hours of playback out of the iPad 2,4. The iPad 2 lasted for just 13.3 hours, while the new iPad ran for 11.15 hours. Power consumption testing showed a 28 percent increase in usage from the iPad 2,4 to the iPad 2 when under a heavy CPU load. 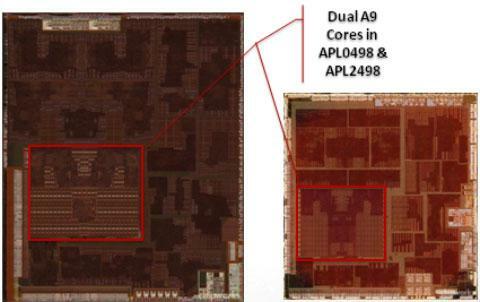 Author Anand Lal Shimpi speculated that the third-generation iPad is "the perfect target" for the 32nm chip because of its higher power needs. As for performance, the report didn't find any difference between the iPad 2,4 and the older iPad 2. It did, however, report that the iPad 2,4 was one degree Celsius cooler than the iPad 2 after playing "Infinity Blade 2" for an hour. "If you're in the market for an iPad 2, the 2,4 is clearly the one to get - if you can find one that is," Lal Shimpi wrote. He expects more of the available iPad 2 inventory will switch over to the iPad 2,4 over time, but he said it's "still pretty tough" to find one for the time being. The report speculated that Apple will "almost certainly" make use of Samsung's 32nm process for the next-generation iPhone. "The move to 32nm is going to be good all around it seems, and Samsung appears to be a very capable foundry partner for Apple," Lal Shimpi concluded.